On Monday, Senator Kawasaki introduced SB 99– Personal Use Fishing Priority. 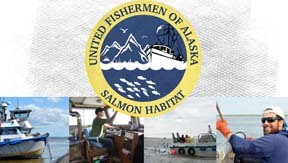 This bill has been introduced at the legislature in years past and UFA has strong opposition to any proposal or bill that would make personal use fishing a priority over subsistence, commercial or sport fishing. We encourage UFA member groups and individuals to please write a letter of opposition to this bill. Letters of opposition may be sent to SenateResources@akleg.gov. Here is an example of theletter UFA Provided. Reminder to current Individual and Lifetime UFA members: Friday April 5 is the postmark deadline for return of ballots for the UFA at-Large board member election! The U.S. Coast Guard is issuing a Worldwide Notice to all mariners who use GPS equipment that on April 6-7, 2019, a parameter in the GPS system will “roll over” to zero, which may affect older GPS equipment, or equipment that has not received firmware or software updates recently. Read the Notice.For Alaska specific information, click here. Civil GPS users are encouraged to report disruptions or anomalies to the U.S. Coast Guard Navigation Center, or via phone at 703.313.5900, 24 hours a day. House Fisheries did not meet this week. March 27, the committee heard SB 51 – Natl. Res. Water Nomination/Designation. Bill was not moved from committee and has meeting scheduled for April 3. Watch the Meeting Here. March 29, the committee heard SB 90 – Cook Inlet: New Admin Area; Permit Buyback. Public Testimony was taken. The bill is still in Senate Resources. March 27, Senate Finance held a hearing on SB 61 – Commercial Fishermen’s Fund: Vessel Owner Claims. Public Testimony was provided by UFA. The bill is currently in Senate Finance and tentatively scheduled to be heard early next week. Legislative Meetings of interest for this weekend and the week of April 1 – April 5, 2019. SB 51 – Natl. Res. Water Nomination/Designation. HB 105Commercial Fishermen’s Fund: Vessel Owner Claims. SB 51 – Natl. Res. Water Nomination/Designation (Senate Resources) Currently in Senate Resources with a hearing scheduled for April 3. SB 61 – Commercial Fishermen’s Fund: Vessel Owner Claims (Stevens – UFA Supports) Currently in Senate Finance with hearing scheduled for April 1. SB 99*NEW* – Personal Use Fishing Priority (Kawasaki- UFA Opposes). Referred to Senate Resources with no scheduled hearings at this time. HB 35– Conflict of Interest: Board Fisheries/Game (Stutes – UFA Supports) Moved out of committee and awaiting referral. HB 41– Shellfish Enhance. Projects; Hatcheries (Ortiz – UFA Supports) Currently in House Finance with no scheduled hearings at this time. HB 65– Fish Tax: Repeal Muni Refunds/Rev. Share (House Rules by Request of the Governor – UFA Opposes) Currently in House Fisheries with hearing scheduled for April 4. HB 105– Commercial Fishermen’s Fund: Vessel Owner Claims. (Ortiz- UFA Supports) Currently in House Fisheries with hearings scheduled for April 2 & 4. Vote while you fish – Register or change your registration before July 22 for the August 21 Primary.